My name is Adam and I've just picked up a HF Turbo i.e. I'm based in North London but originally from Yorkshire. I've always been a fan of the Delta and so this purchase has been a long time coming. I bought it from a previous forum member who advised that I join. With them only being 20 mins away I stuck my head into Zagato and said hello the other day, seemed like nice people. I was enquiring about having a bit of bodywork done as its a bit crusty around the windscreen. 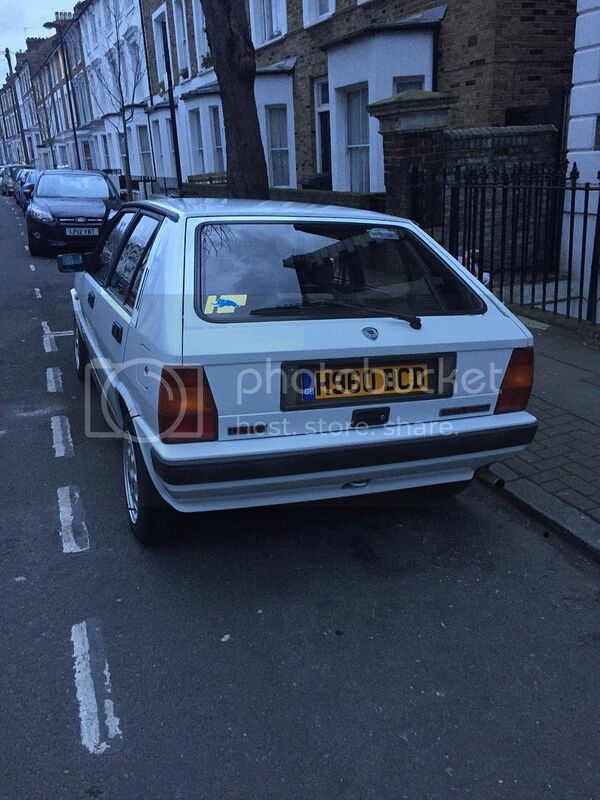 Found it quite bizarre that there is a Lancia specialist in central London! I have quite a few queries as there isn't the usual wealth of online info or even a haynes manual for that matter! Is there a workshop manual that exists for the HF Turbo? I've tried looking online but haven't found much. 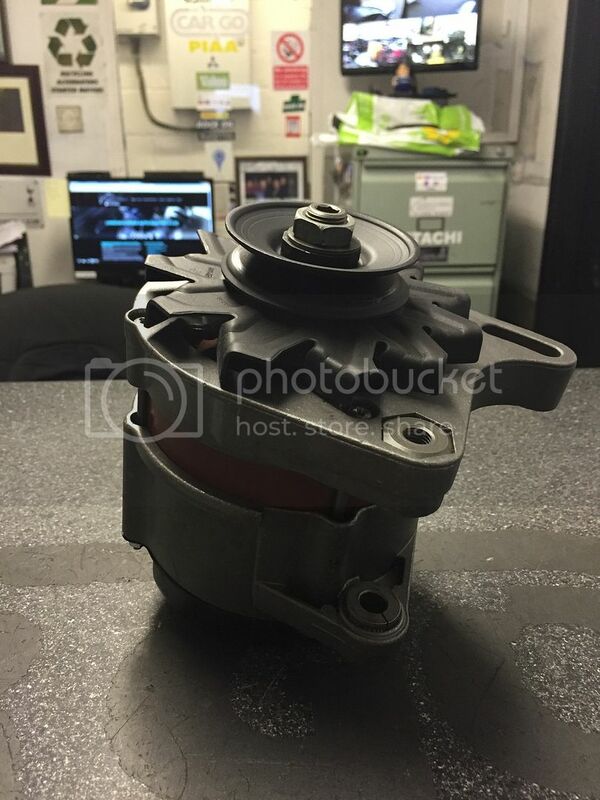 I've been getting usual dodgy alternator symptoms and so have had one that I found on ebay refurbed by the wonderful London Essex auto electrics. How much work is it swap out the alternator? If I wanted to drain the coolant what type should I use? Euro car parts have either blue or pink depending on what year the car is made (blue for pre 2002 I think) Is there a bleed valve or just run up to temp with expansion cap off? The reverse lights don't work, bulbs look fine, my meter didn't get a reading when I had a friend put it into reverse. I assume that it may be the switch? Where is it located on the box? Also any other ideas? The coolant warning light comes on when the engine is started, I've been monitoring temps and all is good, no overheating. When the engine is at operating temp and I turn it off and on the light goes out. I'll leave it at that for the moment, pictures below. Be nice to know if there are any London owners on here. I see ace cafe have a Italian meet, I might pop along to that at some point. Welcome Adam to you and your HF turbo,it looks lovely. I used to own one back in the mid 1990's, great car. 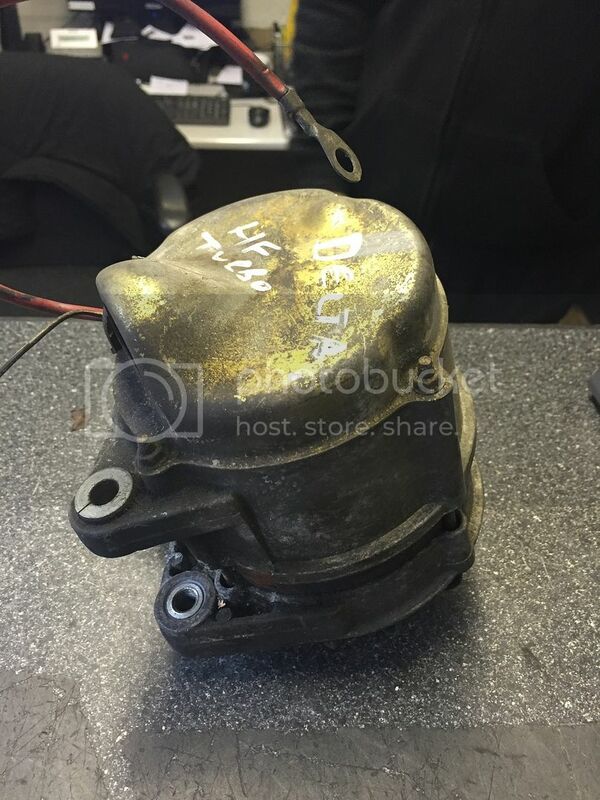 suggest you send a PM to 'Andy D', Andy Deykin has a lovely HF turbo as well as other less exoctic Deltas and he has a lot of experience of them, he also bought my Workshop Manual off of me, so I'm sure he would help you. If you've got electrics that don't work or play up have a look and clean up as many earth points as you can find, including checking the main battery earth strap, as these sometimes look ok but can throw up a number of supposedly unconnected electrical faults, in fact it's probably worth changing anyway. What's the bodywork like at the top of the tailgate aperture, if you've got corrosion around the windscreen the chances are you've got it there as well, not easy to eradicate but well worth stopping in it's tracks. Pretty sure you need blue antifreeze ,as for bleeding I have a fsint recollection. possibly wrong that there's a sort of rubber wheel that you turn on one of the hester hoses? The reverse light switch is once again if I remember correctly is on the back of the gearbox, this may also just need checking for a good connection, if you're going to be removing rear light lenses look on ebay and try to find new red and white plastic screws that hold the lenses in place, these go brittle and break easily. Coolant warning light, check lights also suffer from earthing problems. in my case mobil 1, not cheap but worth the money. don't forget to let the engine idle a little before turning off. Re antifreeze I use blue. Fiat recommend Paraflu which is blue. I generally use. 50% solution to prevent corrosion. IIRC you only need to open the heater valve in the car and pour the stuff in and top up as the car gurgles out the air (not run the engine till all or nealy all a/f is in). Alternator is a packaging nightmare and I think I got mine out when I removed the driveshaft (the cvs needed changing anyway). They are robust units and you may be able to replace the brush set in situ with the car on ramps. Reverse is likely to be the switch on the gearbox (easy to test and buy on ebay), but if not you may have a break in the loom ( it does happen on these cars but not necessarily on the reverse light circuit). Coolant light .... Does the guage read "correctly"? Dont have my circuit diagram to hand but there are only 2 temp sensors - one for the ecu and one for the gauge. Again it could be an earth problem on the dash. It is best to replace the xmas tree earth connections under the dash with hard soldered ring terminals and a lot of unreliability goes away. The warning light is "generated" I seem to remember but scould be wrong. Crusty windscreen is down to Lancia putting drain holes in each corner of back/front windscreens which corrode over time. Requires windscreen out to do job properly ( but it is an easy windscreen to remove). Manuals turn up on ebay every blue moon but not necessarily covering the i.e. versions. There is info on wiring of these cars on some websites. Maybe others can remember where they are. Overall an easy car to work with, and if you have not changed the for a few years I would advise this is changed with tensioner bearing. What a beautiful original Delta. 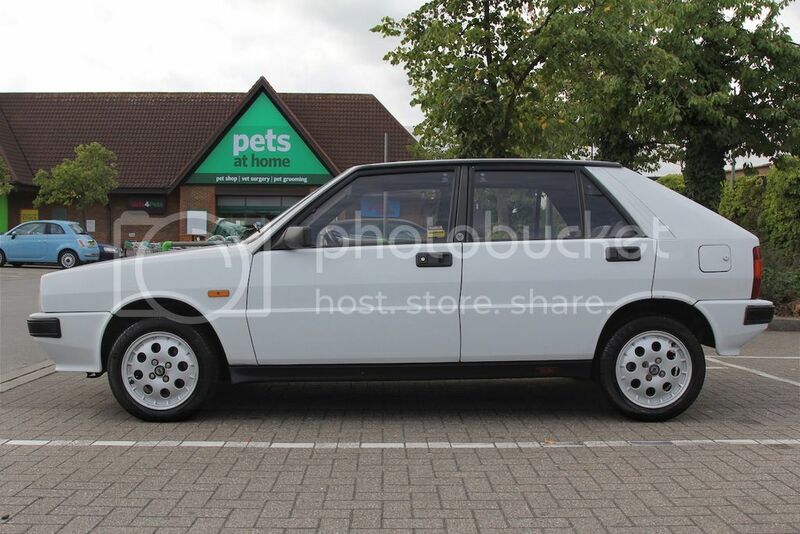 It's so nice to see more non integrale models being appreciated. They have such crisp clean lines. I should have added that there is a bleed at the top of the radiator when refilling. You may find this of use. On eBay right now! Very tidy looking car by the way. 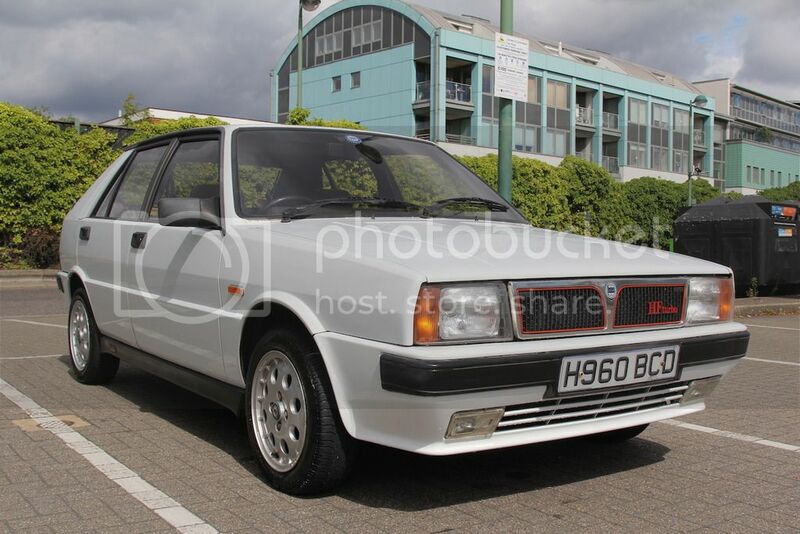 I used to own an E reg Martini HF Turbo which was great fun but seemed to destroy CV joints without being driven enthusiastically. Sadly, the car was scrapped by the next owner when it failed an MOT. Hey guys, apologies for the delay in replying, a bit of a busy week. Thanks for the positive words and info. Yes there is a bit of superficial rust around the tailgate too, you know these cars well! Will check any obvious earth straps. The xmas tree earths you talk about under the dash, where are these? Don’t get me wrong all the lights (literally every single one!) come on and everything works as it should, its just the coolant light, I’m hoping a flush may help. Temp gauge seems to behave, car gets up to 190f and tends to stay there. Should I use a fully synthetic engine oil? Any other opinions on that? Yes that manual is expensive! Is that the going rate? Attached a pic of the tired alternator I got from eBay and what it looked like 24 hours later, fully stripped, blasted, bearings/brushes replaced and sprayed. Can't recommend LondonEssex enough. Gave her a polish and wax yesterday and fitted some pressed plates as the originals were tired, pic attached. Gonna speak to a few other bodywork shops through the week and get some quotes together for sorting the windscreen. Any other London owners on here? Look for where all the black earth leads congregate under each side of the dash. I think this is what is being referred to as a "Christmas tree". There's also a round version with spades sticking out all the way round the mounting screw. Thats the one. Replace with ring terminals soldered on to the black leads and bolted in place of the tree. Thoughts on engine oil? Fully synthetic? On a turbo, definitely I would say. As I said I always used fully Synthetic, but having looked at the link steve posted elsewhere the handbook shows Selenia 15/40w semi Synthetic. For peace of mind with the heat involved with a turbo I'd still recommend using a good Fully Synthetic oil.